Does have two minor dents, one on hood and one on rear quarter panel. This Jeep has been the hands down best vehicle I’ve ever had the privilege to own! It can get me through ANYTHING, and is trusty and dependable. I took really good care of it, and it’s one of the cleanest Jeeps you’ll find. I handwashed it about once a month, and treated the soft top with only Bestop cleaners and conditioners. I have records of every repair it needed in my seven years owning it, plus the records I got from the previous two owners. The first owner happens to be a friend of the family, who was also meticulous about its care. I didn’t beat the Jeep up off road, it’s primarily been my daily driver. Almost all miles are highway miles. It drives great on city streets, highways, and trails. 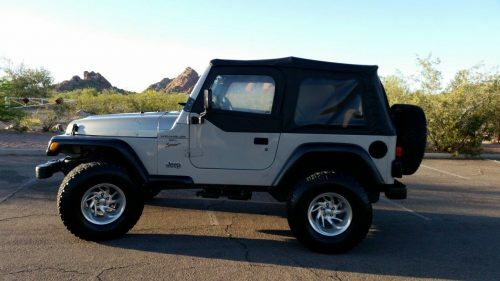 Arizona is the perfect place to own a Jeep: you can take the doors and soft top off almost year round, and that’s one of my favorite things about it. This will be one of the most fun vehicles you will ever own. If you’re interested, please send me an email! I have tons of pictures to show you as well.